Celebrities do everything ten times bigger than most people. That’s why celebrity engagement rings often cost thousands or millions of dollars. And celebrity engagement rings aren’t the kind you’ll find at the local mall either. Celebrities usually turn to well-known, expensive, designers to create their engagement rings. Celebrity watchers have undoubtedly heard of Harry Winston, known as the jeweler to the stars. Harry Winston (or The House of Winston) is one of the most beloved designers in Hollywood, and is also one of the most sought after designers of celebrity engagement rings. The company was founded back in 1932, and is still going strong from its main headquarters in Beverly Hills. Harry Winston has created some of the most famous celebrity engagement rings in the world. Actor Richard Burton sought the help of Harry Winston when he proposed to Elizabeth Taylor. Burton purchased a 70 carat pear-shaped engagement ring for his bride-to-be. In the world of celebrity engagement rings, 70 carats is modest. The exclusive work of Harry Winston is sought by numerous celebrities. Harry Winston’s celebrity engagement rings are available in numerous designs and settings. They range in price from $1,000 all the way to the $40 million. Although diamonds are the gemstone of choice for most Harry Winston creations, upon request, alternative gemstones can be incorporated. You don’t have to be a celebrity to own a Harry Winston engagement ring, but it helps. Like most high-end designers, Harry Winston rings use the highest quality gemstones available. The carat weights are also on the larger side. If you’ve got a few thousand (or million) dollars sitting around, you may be able to afford a modest piece from the collection. If you’re interested in visiting a Harry Winston location, they’re located in major cities such as New York, Los Angeles, Tokyo, and Paris. Is it possible to imitate just about any piece of jewelry? After all, not everyone can pay what celebrity engagement rings cost. You may have to settle for lower quality gemstones, but the end product will be a beautiful creation. Equally adored by celebrities is Tiffany & Co. The company is more than 150 years old, and creates its fair share of celebrity engagement rings. Tiffany engagement rings are known to be flawless. Celebrities trust Tiffany & Co. because they know they’ll get their money’s worth. Like with most celebrity engagement rings, Tiffany rings aren’t cheap. They range in price from the high thousands all the way into the millions. Celebrities set many of today’s fashion trends, and replicas of celebrity engagement rings are always in demand. 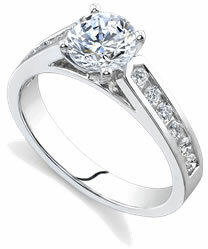 For the best looking replicas of celebrity engagement rings, it may be necessary to go for design instead of diamonds. You may not be able to afford an 18-carat diamond, but you can probably copy the design using smaller, less expensive gemstones.